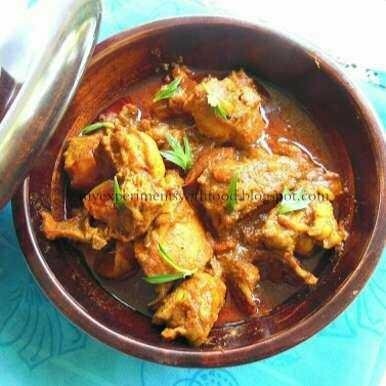 Ummachi spicy and delicious chicken curry mixture all the powders are required to marinate on the chicken and keep it separate for 30-45 minutes. Heat a strictly and fry the onions until golden brown. Add the green chili in it and stir well. Add the crushed ginger and garlic, stir thoroughly until the raw smell disappears. Add marinated chicken, salt and mix well. Add a little water and close with a lid for approximately 15-20 minutes or until the chicken is well cooked. Add garam masala powder and cook it for a few minutes. Adjust water according to the thickness of the gravy. Serve hot with boiled rice or chapati. This post has received a 8.24% upvote from thanks to: @jumi. You got a 10.08% upvote from @redlambo courtesy of @jumi! Make sure to use tag #redlambo to be considered for the curation post!